Land Rover has given a second-gen Range Rover Sport that arrived in 2013 a facelift. 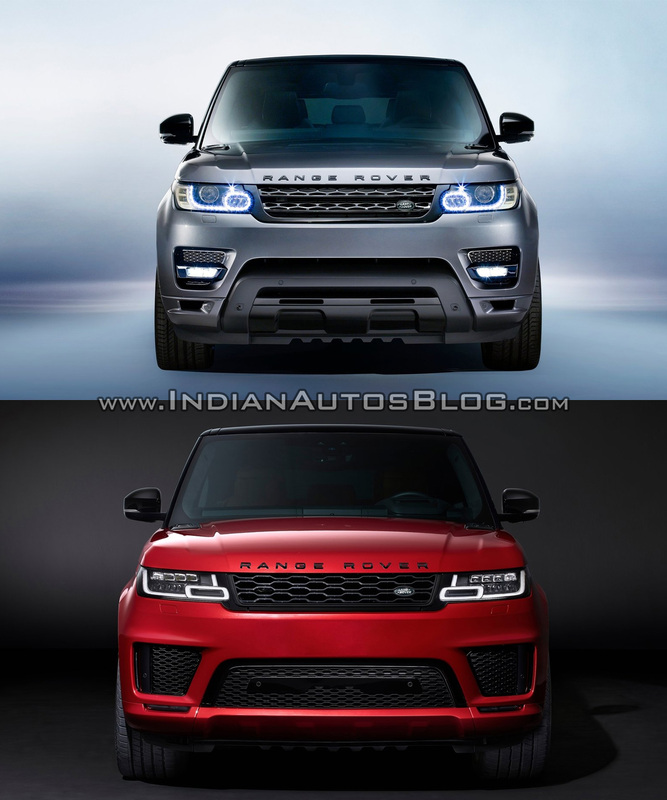 Here’s a visual comparison between the 2018 Range Rover Sport and the 2014 Range Rover Sport. Land Rover has discontinued the 3.0L SDV6 Hybrid model in favour of a new 2.0L Si4 PHEV model. The 2018 Range Rover Sport features subtle design changes on the outside. At the front, updates include slimmer grille, new slimline headlights (Premium/Matrix/Pixel/Pixel-Laser LED), dynamic turn signals and remodelled front bumper with slimmer & brighter LED fog lights. The new bumper design has improved airflow for enhanced cooling. The Premium headlights have 24 LEDs, while the Matrix LED headlights have 52 LEDs. The Pixel LED headlights have 142 LEDs - all individually controllable. The Pixel-Laser LED headlights increases that count to 144. This lighting system throws light beyond 500 metres. On the sides, the fender vents have a new design and there are three new alloy wheel options in 21- and 22-inch sizes, with silver, diamond-turned or black finish. At the rear, the 2018 Range Rover Sport has a more aggressive slotted spoiler profile that also helps to reduce the accumulation of dirt on the back glass, new slimline tail light clusters and dynamic turn signals that sweep from the inner to outer corner of the lights, the same way as in the headlights. Inside, the mid-cycle refresh has brought substantial updates to the Range Rover Sport. New Ebony Vintage Tan and Ebony Eclipse colourways, semi-aniline leather upholstery, slimmer front seats with new foams, trims and interlayers, new stowage solutions, new ambient lighting, Nanoe cabin air ionization system, all-new 12-inch high-resolution digital instrument cluster, next-gen head-up display system with 10-inch full-color projection, Touch Pro Duo infotainment system with two 10-inch HD touchscreens, 10-inch touchscreens for the rear-seat entertainment system are the main changes. The 2018 Range Rover Sport is available with ten powertrain choices. A new 2.0-litre Si4 model starts the petrol range now. It has the new 2.0-litre Ingenium turbocharged four-cylinder petrol engine that produces 300 PS and 400 Nm of torque. The 5.0-litre supercharged V8 petrol engine now produces 525 PS (+15 PS) and 625 Nm of torque. The 2018 Range Rover Sport SVR’s 5.0-litre supercharged V8 petrol engine puts out 575 PS (+25 PS) and 700 Nm (+20 Nm) of torque now. Land Rover has discontinued the 3.0L SDV6 Hybrid model in favour of a new 2.0L Si4 PHEV model. The plug-in hybrid model, also called P400e, uses the aforementioned 2.0-litre Ingenium petrol engine (300 PS/400 Nm) and an electric motor generating 116 PS and 275 Nm of torque to deliver total 404 PS and 640 Nm of torque. Its fuel economy and CO2 emissions rating are 2.8 L/100 km (35.71 km/l) and 64 g/km respectively. The Range Rover Sport P400e has a lithium-ion battery mounted beneath the boot floor that takes as little as 2 hours 45 minutes for a full charge, using a 32 amp wall box. Using the 10 amp home charging cable, one can fully charge the battery in 7 hours 30 minutes. The plug-in hybrid Range Rover Sport has an electric-only range of 51 km. 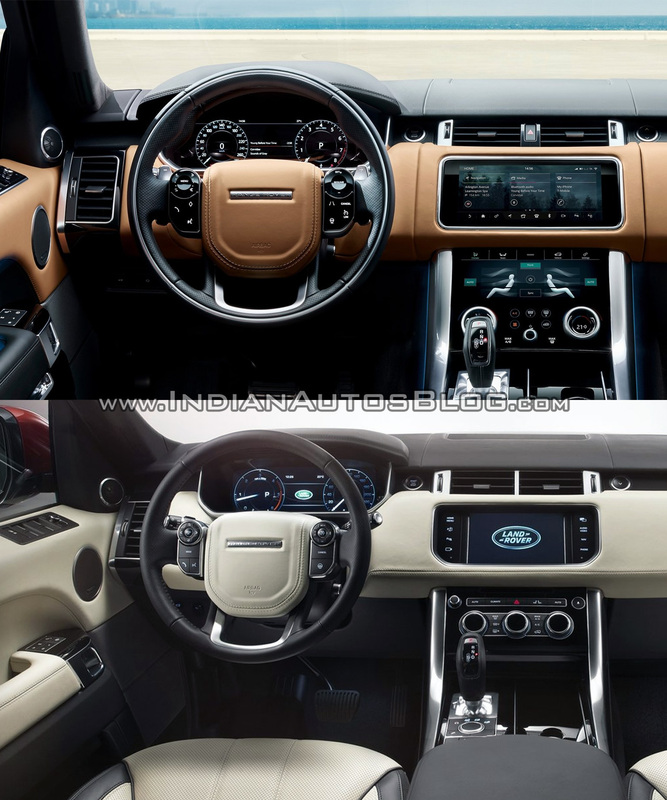 The Range Rover Sport also has the Touch Pro Duo infotainment system like the Range Rover Velar now. The 2018 Range Rover Sport’s deliveries internationally will commence at the end of 2017. The facelifted model should go on sale in India in the first half of 2018.